The government’s flagship programme to shake up the benefits system is facing fresh problems in a battle between two departments at the heart of the scheme, documents leaked to the Guardian show. 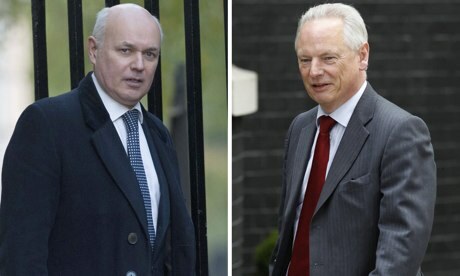 Friction between Iain Duncan Smith‘s Department for Work and Pensions (DWP) and the Cabinet Office overseen by Francis Maude is now causing “high-level” risks to the delivery of the project, according to minutes of a Whitehall meeting. Maude’s department, minutes of the government’s “universal credit board” confirm, has also accelerated the pullout of its elite team of IT experts from the project after what sources describe as serious tensions over the way the £2.4bn overhaul is heading. The DWP is now urgently searching for new IT specialists to keep the complex software project on track. As a result, future implementation of universal credit could now face delays and increased costs because of the rapid pullout, senior civil servants were told, according to the minutes. Universal credit, an idea championed and pursued by Duncan Smith, seeks to roll six benefits into a single streamlined payment. But it has been dogged by design errors,multimillion pound write-offs andnumerous setbacks. The project has also become more central to government plans to reduce the deficit after the chancellor, George Osborne, warned this week that a further £25bn of spending cuts would be needed after the next election. As much as £12bn could be taken from the welfare budget, he said. Despite a scathing NAO report in September Duncan Smith had been insistent that the project remained on time and on budget. In December he revealed a new plan for delivering the project. Duncan Smith is understood to have insisted on a “twin track” approach– keeping current universal credit development going to prove claimants could use the service before the 2015 election – while ordering money and time to be ploughed into a web-based system that did not rely heavily on jobcentre staff to fill in claimant benefit details. According to the newly approved plans, hundreds of thousands of benefit claimants will then be transferred from one design of universal credit programme to the other once the digital design is ready sometime after the general election. Maude and his government digital service (GDS) experts team objected to the twin-track approach. However, he was outflanked by “a majority” of other government ministers and project advisers, the leaked minutes say. A separately leaked, highly restricted risk-assessment document makes clear that the rapid withdrawal of Cabinet Office experts is now one of the most serious problems facing the project this year because the DWP might not be “able to obtain the skills required to replace GDS within the current market at affordable cost”. According to the leaked minutes, the former Olympics executive Howard Shiplee, who is now in charge of the troubled programme, described the accelerated GDS withdrawal as “disappointing” during the meeting held on 27 November. Shiplee’s next in command, Ann Harris, also disclosed during the meeting that due to the multitude of problematic issues facing universal credit, the project was coded “red” overall. The leaked board minutes state: “GDS wished to accelerate their withdrawal from the design and build team to allow DWP to take ownership. “However, as GDS have supplied most of the expertise and resource to date, a recruitment exercise needs to be undertaken to fill the technical vacancies, there is therefore the likelihood of some delay. During the meeting one other senior civil remarked that “friction between DWP and Cabinet Office” made things more “difficult than necessary”. A source close to Duncan Smith denied that any division existed between departments. Rachel Reeves, the shadow work and pensions secretary, said, “Iain Duncan Smith’s repeated promises to deliver universal credit ‘on time and on budget’ have been broken, with an astonishing £40m written off so far, £91m written down and only a handful expected to claim universal credit by 2015. This entry was posted in Uncategorized and tagged Cabinet Office, dwp, Francis Maude, Iain Duncan Smith, Universal Credit. Bookmark the permalink.